Could you tell us a little bit about your academic history? I went to a high school that had excellent coursework in almost every field except for technology, so I discovered my interest in computing through an HTML course and a Mathematical Models course. I really liked statistics, and I really liked behavioral sciences, but I never knew how they could intersect until I developed some technical skills. Now, I’m studying computer science in CAS, and minoring in math and social business, with a new perspective on how CS, math, and society can combine. How did your interest in computers and app development evolve? I enjoyed the problem-solving aspects of computing when I was growing up. I was an active member of a FIRST robotics team, and took a liking to the structure of the GUI for programming the LEGO NXT. The first programming skills I ever learned for a class were HTML and R in high school, though I didn’t know I would study computers in college until I started applying. Surprisingly, now that I’m a senior, those two early skills almost never came up in college, but the general lessons learned from those classes certainly did! 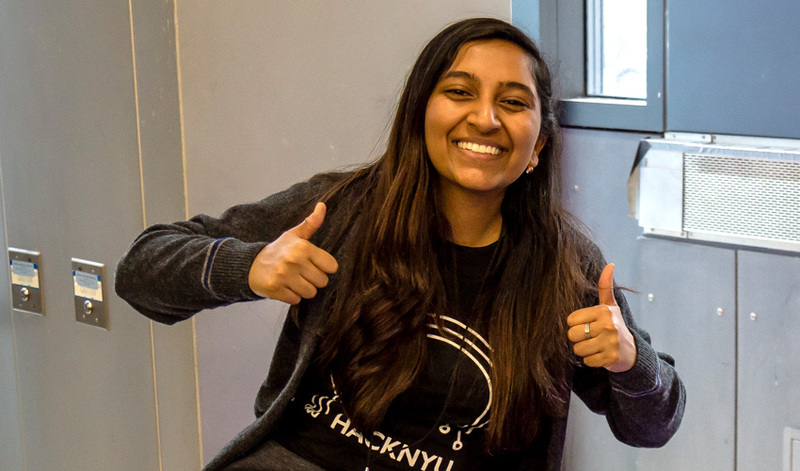 How did you get involved with HackNYU? As a freshman, I volunteered at HackNYU because I was too scared to actually register. Hackathons seemed like an impenetrable fortress, where only the prodigal software engineer would prevail. 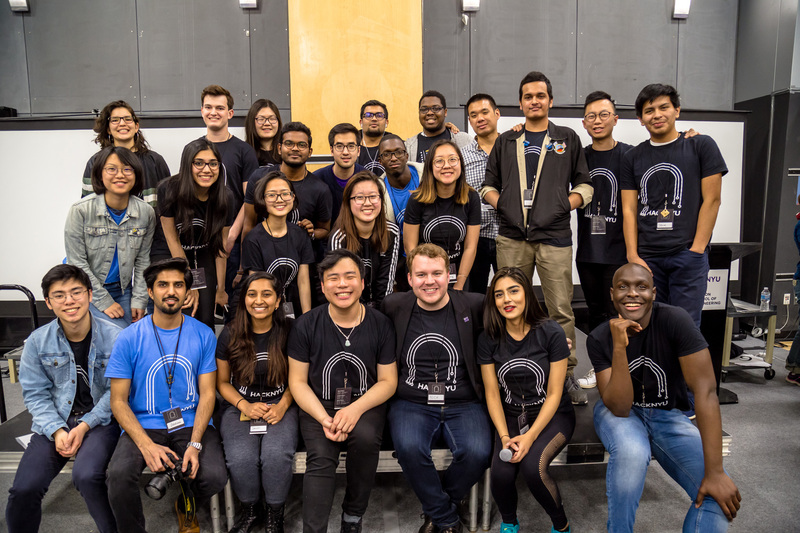 I quickly learned that this wasn’t the case at all for HackNYU, and I ended up enjoying the event so much that I joined the logistics team as a sophomore in 2017. I made so many lovely friends who believed in me enough to grant me the position of Logistics Chair for HackNYU 2018. Now I’m here as Executive Co-Chair, and I’m hoping to do our whole staff proud this year! What is the most exciting thing about HackNYU for you? HackNYU has always been such a friendly and welcoming environment that it helped me see that hackathons aren’t scary! We have such a varied group of organizers and hackers alike, and we also attract a lot of first-time hackers. I take a lot of pride in making our hackers feel supported and giving everyone a chance to learn something neat or build something cool, without feeling like they have to win anything to have a good time or get something useful out of the experience. What was the most surprising thing about being a co-chair? The most rewarding? I was surprised at just how many directions you get pulled in – one minute it’s guiding sponsorship acquisition, the next is figuring out what games to play at midnight. You essentially start thinking about HackNYU when you lay the groundwork each year, and then you don’t stop until the event’s over. It’s definitely helped me develop the ability to be more decisive, since you often need to make decisions quickly and then stand by them. I think I found a great sense of reward in bringing together our wonderful organizing team and seeing them make ideas into reality. We wouldn’t be anywhere if it wasn’t for our amazing Board, and I hope they know just how invaluable they’ve been to me this past semester. What are you looking forward to most this year? What keeps you going the entire weekend? I’m looking forward to seeing all the new and exciting changes we’ve made this year come to fruition! We’ve really innovated for HackNYU 2019, and I’m excited to see how it’s all received. I’m driven by wanting to make sure that every single person at HackNYU leaves the event with good memories and a desire to create even more after everything is over. Teams having a eureka moment, hackers enjoying themselves during a fun activity, or mentors working out bugs with students – all of these make the herculean effort of running HackNYU worthwhile. What have been some of your fondest memories from past HackNYU events? I have made incredible friends at HackNYU, and I’ve also been inspired by many stories during the event! Personally, I have fond memories of the wonderful friendships I’ve developed over the course of one weekend, getting pushed through hallways on a mail cart or making sure food gets out to everyone that wants it. The people are absolutely what keeps me coming back every year, and I know HackNYU’s team is special. I think I’m always inspired by the people and the projects that come to HackNYU – first time hackers that win entire tracks because they made something they believed in, or high schoolers who make something I couldn’t even dream about in high school. I’m inspired by stories of hackers who discovered something they love doing with the help of our mentors, or the smiles on proud faces during the project expo. What advice would you give someone participating in this year’s event? I would say that hackers should come to learn, not to win! A lot of our most successful hacks come from people who found an interesting problem that they wanted to help solve, and then refined the skills they needed to build their hack right there at the event! Come with an open mind and an eagerness to learn and collaborate, and I promise you’ll have the best HackNYU experience. What advice would you give someone who wants to get involved as a student organizer? For would-be organizers, follow our Facebook page! It’s where we’ll let you know when we’re looking for new members next year. As far as characteristics, I think it’s important to know that you don’t have to be a software engineer or an app developer to get involved with HackNYU. We wouldn’t have HackNYU without people who can communicate effectively, people who have a strong business acumen, people who are artistic, people who just have a passion for making this experience the best it can be – no matter if they’re studying CS, art, education, finance, or even electrical engineering. It is truly an effort between all kinds of people to make this event happen, and as long as you are a responsible team player, we’d love to have you help us make every year better than the last.